Prefabricated Guard Booths: A Modular Design for Your Guard Booth | BIG Enterprises Inc.
A common misconception about prefabricated guard booths is that they all have a cookie-cutter design and standardized design elements. While it is true that these guard booths are constructed using similar methods, they are custom designed in a way that specifically meets the needs of a facility. For that reason, guard booths that come prefabricated are actually flexible, making them the perfect solution for a variety of uses. What makes modular guard booths such a great investment is that it is possible to move portable guard booths from one location to another with relative ease, you can choose from a host of amenities. Not only will a portable guard booth bolster security and functionality, it provides a comfortable space for your security team to work in. To ensure that you get what you need, it is important to consider only the best guard booth manufacturers, those with experience, expertise, and solid reputations. Oftentimes, this kind of portable guard booth is relatively small in size, with just enough room for one attendant along with storage space for any type of equipment required for the job. If preferred, you can opt to have amenities added to prefabricated guard booths, including heat and cooling, a restroom, skylight, and more. In fact, a portable guard booth can be designed to be bullet resistant. Overall, modular guard booths have one primary purpose, which is to provide an additional form of protection for your company, while keeping the attendant safe. However, for security staff that spend hours inside of a portable guard booth, some comforts are necessary. This is why guard booths fabricated off-site are made to protect the attendant from outside elements, while still being convenient for talking to people coming onto and going off of the property. With modular prefabricated guard booths, the entire guard shack is constructed offsite by reputable guard booth manufacturers. Once complete, the guard booth is delivered to your site, ready to bolt to a pre-existing concrete pad that you have prepared. While modular guard booths provide multiple purposes, the primary focus is on better security for your company. Whether used as an employee checkpoint or to control non-employee foot and vehicle traffic, a portable guard booth is an exceptional choice. At B.I.G. 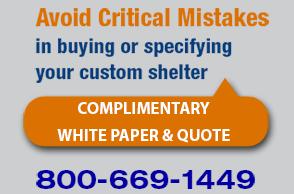 Enterprises, we take immense pride in making top-of-the-line modular prefabricated guard booths. To learn more about our different products, please visit our website. For scheduling an appointment to discuss your next modular guard booth, we look forward to your call.